Hair transplant is a constantly evolving science. From the time that it was conceived by Dr. Norman Orentreich to the present state, the procedure of hair transplant has undergone multiple advancements. In this article, we discuss in brief regarding the strip follicular unit transplantation. We summarize the major points regarding the procedure of strip follicular unit transplantation along with some nuggets of experience that we have gathered over time. We briefly deal with the indications, anesthesia, procedure, and complications of strip follicular unit transplantation and some special scenarios like the repeat excision of strip. Hair transplant is a constantly evolving science since it was first conceptualized in Western medical literature by Dr. Norman Orentreich. He started transplanting with 4-mm punch grafts from the occipital donor area to the frontal bald recipient area in 1952. This was followed by rapid evolution of the art and science of hair transplant, and by the 1980s, the hair transplant surgeons were taking out strip from the occipital donor area and dissecting it to get mini or micro grafts to achieve more natural look. But the concept of follicular units was first introduced by Bernstein and Rassman in 1994–95. This completely radicalized the field of transplant. Stereomicroscopic dissection of the strip was carried out to get follicular units. This greatly improved the results. This practice of graft harvesting from a strip and stereomicroscopic dissection of the graft to produce follicular units is known as strip follicular unit transplantation (FUT). This procedure has been considered as the gold standard in the field of hair transplantation. Before taking up patient for FUT, it is imperative to understand which all patients can be taken up for strip or FUT surgery. Broadly, all the patients can be taken up for strip surgery except in some special conditions. Patients who are bad candidates for strip surgery are the ones with very tight scalps or with connective tissue disorder (such as Ehler–Danlos syndrome) or where multiple strip surgeries have already been taken out earlier. Patients need to be explained about the limitations of the procedure and especially regarding the creation of a linear scar. Once it has been decided to take up the patient for FUT, area of the scalp from where the strip is to be excised is marked. Different surgeons have different reference points, but we will discuss the points that are used by us. We mark three points on the scalp. The central point is the bony occipital protuberance. It is better not to go below the occipital protuberance as there are higher chances of scar dehiscence due to pull by the neck muscles. Also, there is a higher chance of losing hair below occipital protuberance in case of retrograde alopecia, which may develop over a period of time. The lateral point for safe harvesting is the line drawn vertically from the anterior point in tragus about 2cm above the superior helix. The third point is between these two points and lies about 1.5cm posterior to the retro-auricular hairline and 1.5cm superior to the uppermost limit of the ear. After identifying these points, the donor area elasticity should be assessed. This is important because poor scalp elasticity may be followed by dehiscence postoperatively. For this, we use the Mayer and Paul technique of measuring scalp elasticity. Two dots are marked on the scalp 50mm apart and the scalp is compressed between right and left thumbs. The distance between the two dots are again measured while compressing the scalp. This resulting measurement is subtracted from the original measurement and is expressed in percentage. For example, if during compression the distance between the 2 points is 40mm, it is expressed as ([50 − 40]/50) × 100 = 20%. Thus, depending on the elasticity of the scalp, then the safe width of the strip is calculated. And the patients with poor scalp elasticity are advised for scalp relaxation exercises few weeks to months prior to surgery. Next, we decide the length of the strip to be taken. This depends on the number of hairs that is required for surgery, elasticity of the donor area, and the density of hair in the donor area. The density in the donor area can be calculated with densitometer or TrichoScan or dermatoscope. For example, if we need about 2000 grafts, and density of hair is 80/cm2, then a strip of around 25-cm length and 1-cm width is taken out. Once the length and width of the strip are decided, the patient is taken up in the operation theater. The donor area is trimmed with a trimmer. The area of the strip is marked with a skin marker. The marking is carried out prior to tumescence as it can sometimes alter the structure of the skin. The hair above the donor strip is neatly combed upward and pasted with a micropore tape so that it does not disturb the harvest area. The strip area is then sterilized with Betadine Solution. Anesthesia in the donor area is achieved by giving occipital nerve block. To give the block, the occipital prominence is palpated and three fingers are placed over it. A 30 gauge needle is inserted just lateral 1cm below and lateral to the occipital protuberance, and 2mL of 1% lignocaine with 1:100,000 adrenaline is injected on each side. This is followed by donor area field block. We after harvesting of the strip inject 0.25% bupivacaine into the donor area to prolong the duration of anesthesia. After administering anesthesia, tumescense is injected in the area to be excised to get a uniformly tense and smooth surface for graft harvest. The tumescense is injected not only on the area to be harvested, but also half centimeter above and below the area chosen for strip harvest. It is injected on the subcutaneous plane. Adequate tumescence separates the skin from the nerves and vessels that run the galeal plane and decreases chance of neurovascular injury. With adequate tumescense, very less bleeding occurs during the surgery. Also superficial tumescense straightens the hair follicle and decreases chance of graft transection while taking the strip. The strip is harvested immediately after superficial tumescense, otherwise the fluid might be absorbed by the tissue. Once we have achieved proper tumescense, we separate the strip from the surrounding tissue with the help of Haber Spreader. We first score the skin with cut to size (CTS) blade set to a depth of around 2mm (fitted on the blade holder) [Figure 1]. The spreader is then positioned at the incision site and firmly pressed to penetrate the incision. The spreader is then opened. This separates the tissue along with the hair follicles along the natural dissection plane. In this technique, there is minimal to no transection of the hair follicle leading to better yield of the grafts. The spreader is repositioned along the incision to get the complete strip. The spreader technique decreases the time required for harvesting of the graft and is an easy-to-learn technique. If the spreader is not available, skin hooks can be used. After strip is removed, the base of the scalp is checked for any areas of active bleeding. It is best to remain superficial and avoid any injury to the vessels. But in case there is any active bleeding, the vessel should be cauterized with an electrocautery. Usually neurovascular bundles in the skin run together and in cases of vessel injury, the nerve injury can also occur. So, after any vessel cautery, it is prudent to inject 0.2–0.3mL triamcinolone acetonide 3.33mg/mL in the surrounding area to diminish the nerve inflammation. To have a thin, imperceptible scar, trichophytic closure [Figure 2] is also performed by us in required cases. Trichophytic closure should not be attempted in cases of excessive wound tension. While performing closure with this technique, either edge of the strip can be de-epithelialized. A sharp microserrated scissor or a razor blade can be used. We prefer to use a CTS blade set to a length of 1mm to de-epithelialize the lower edge of the wound. The upper end then “lips-over” the lower end and produces excellent results. After removal of epithelium, the lower end is checked for any minor bleeders. If there is none, then dressing is performed to cover the wound. After the strip is removed, it is dissected into slivers and individual follicular units. The graft silvering and dissection should be carried out under magnification [Figure 3]A and B. We use Mantis microscope, but some surgeons use video microscopes as well and they use a magnification of 10–25 to get a better clarity. The first process is called graft silvering. This is the most technically exacting step. In this step, the donor tissue is divided into thin sections or slivers. Sliver is a single row of hair follicles that has been excised from the strip [Figure 4]. An expert assistant can make slivers with minimum to none follicular transections. After slivering, the individual follicular units are then prepared and the epithelium is trimmed off from the top of grafts [Figure 5]. They are then kept in chilled Ringer Lactate or chilled saline solution and implanted as per the requirement of the patient. Other holding solutions that can be used are similar to the ones being used to in organ transplant surgeries such as hypo-thermosol alone or in combination with Liposomal. Both of these solutions have been found to have a benefit in long surgeries. Figure 3: (A) Graft silvering and dissection under magnification. (B) Graft silvering and dissection. 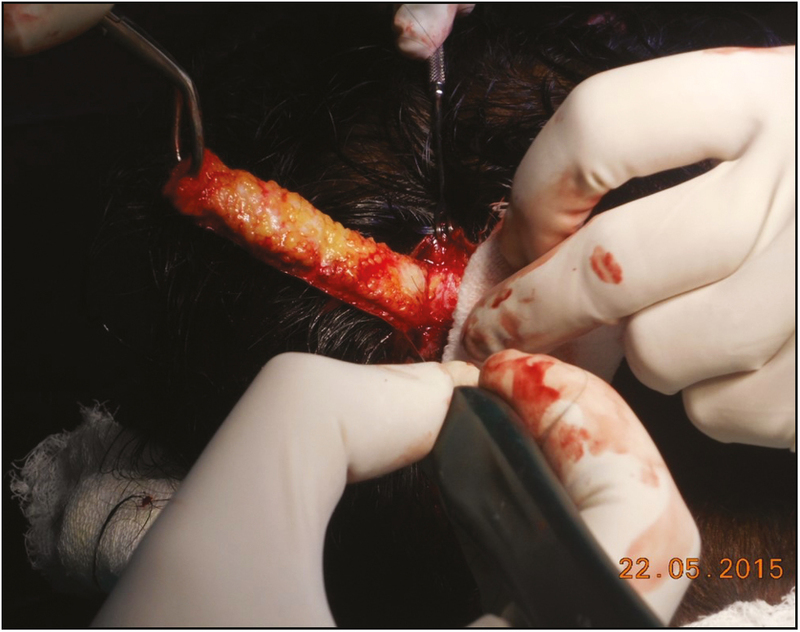 The complications that follow strip harvesting are mainly the result of some damage to the neurovascular bundle lying in the galeal plane or due to poor wound closure. On the lateral edge of the strip, the damage to the temporal artery is a major risk during the operation. If there is damage to the temporal artery, this can be followed by massive telogen effluvium during the postoperative time, leading to unhappy patients.,Apart from the diminished supply and resulting hair loss in the area supplied by the artery, damage to the arteries may also compromise wound healing. If the artery has not been cauterized well, and left to bleed, it can also lead to hematoma in the postoperative period. Nerve damage during the surgery can also occur, which may lead to prolonged or permanent insensitivity of the donor scalp. 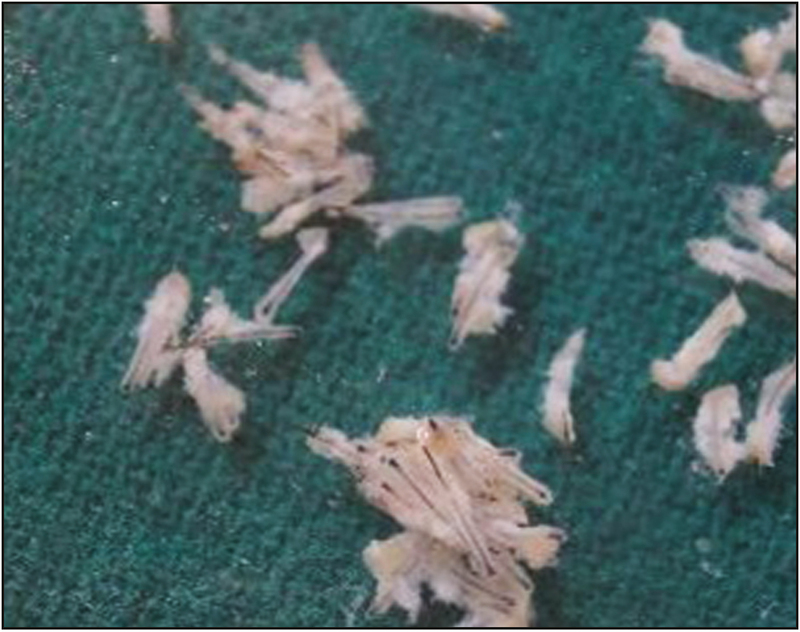 During harvesting of the strip, there might also be some transection of the hair on the edges.,If there are multiple transections, these transected hairs might affect wound healing. Poor scar closing technique and wider strip in presence of poor scalp laxity may lead to large and unsightly scar in future [Figure 6]. If the scalp tension is too much, there might be scalp dehiscence postoperatively. Sometimes, the size of the scar may exceed the size of the strip. Such unsightly large scars can be camouflaged with hair transplantation on the scar or with scalp micropigmentation. 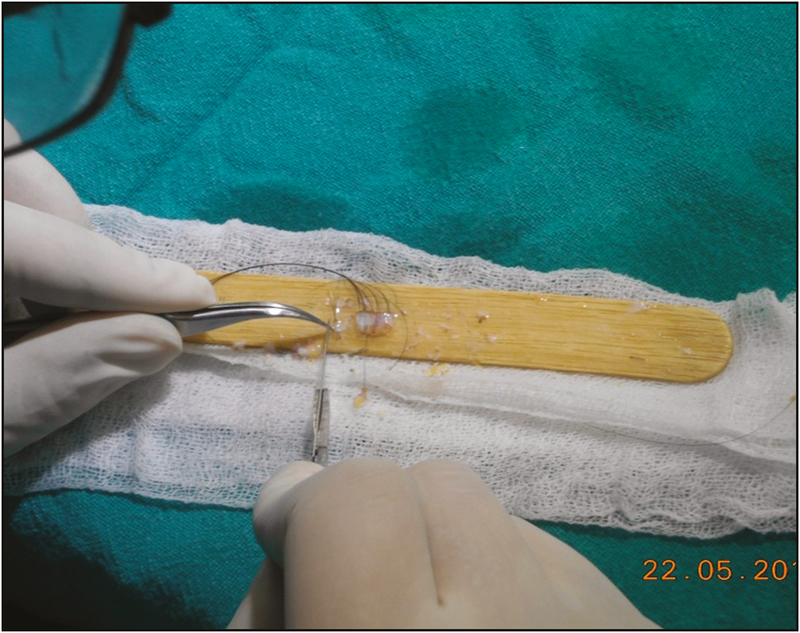 If hair transplantation is carried out on the scar tissue, it should be nonlinear and the graft density can be 50–75% of that used in frontal scalp. Figure 6: A well-healed FUT scar vs. a widened scar. Attempts to do scar excision can also be made with careful considerations. If the scar is larger than few millimeters, further excision and remodeling of the scar can lead to larger scar as the factors such as poor scalp laxity or poor blood supply, which caused the previous scar to be wide, may still persist and lead to larger scar. Hence, we need to be very careful in our patient selection for the strip harvesting. There might also be incidences of scalp necrosis, prolonged scabbing, and telogen effluvium in the donor area. It is advisable to wait for minimum of 9–12 months before taking a revision strip to allow adequate time for wound healing. This time allows the scalp to regain some degree of laxity before the next surgery. It is recommended to remove the previous scar during second surgery unless the scar is wide. One must remember that removal of previous scar limits the number of usable grafts and this must be factored while estimating the graft number from the strip. One major advantage with the strip surgery is that the strip is taken from an area in the occiput, which is more or less the permanent donor zone, whereas in case of follicular unit extraction (FUE) surgeries, the grafts may sometimes be taken from the zone exceeding the permanent donor area. This may lead to loss of transplanted hair in due course of time. Also, the dissected grafts in strip have a larger subcutaneous tissue area surrounding them, and hence the grafts are considered healthier than the FUE grafts. To conclude, graft harvesting and follicular dissection is a challenging procedure. One may say, that in the current era, strip transplantation is a procedure being limited to only few centers by select surgeons, due to technical difficulty in mastering the skill for the surgeon and the team. 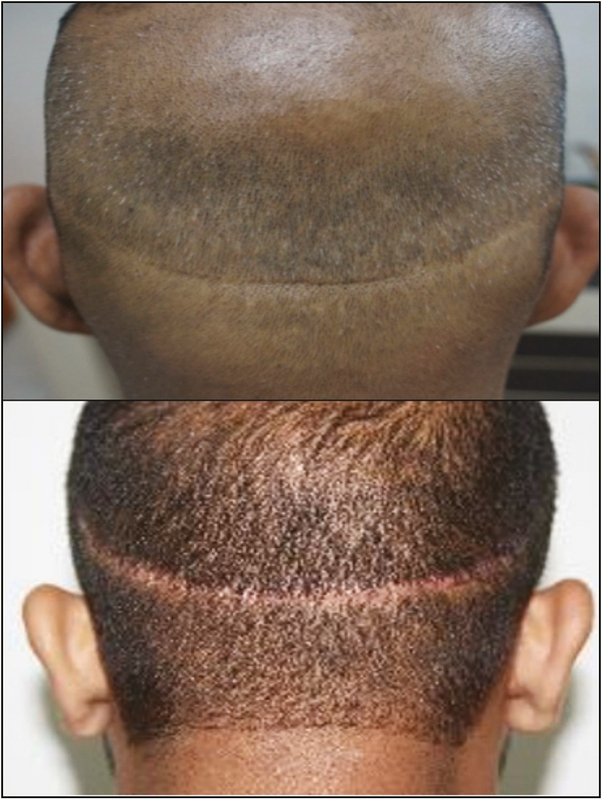 However, strip transplantation still has an important role to play especially in cases of “mega sessions” and “giga sessions.” We combine it with FUE to harvest maximum number of hair from scalp in a single sitting. And, this is where, we feel that strip will keep on having its place in the field of hair transplantation. Shiell RC. A review of modern surgical hair restoration techniques. J Cutan Aesthet Surg 2008;1:12-6. Marzola M. Single-scar harvesting technique. In: Haber R, Stough D, editors. Hair transplantation. Philadelphia (PA): Elsevier Saunders; 2005. pp. 83-7. Mayer ML, Perez-meza D. Temporal points: classification and surgical techniques for aesthetic results. Hair Transplants Forum Int 2002;12:147-58. Mayer ML. Evaluation of scalp elasticity. In: Unger W, Shapiro R, Unger R, Unger M, editors. Hair Transplantation. 5th ed. London, United Kingdom: Informa Healthcare; 2011. pp. 267-70. Sam LM. Hair transplant and Local Anaesthetics. Clin Plast Surg 2013;40:615-25. Sam LM. Hair Transplant Operative 360. In: Sam LM, editor. Hair transplant 360 for physicians. New Delhi, India: Jaypee Brothers Medical Publisher; 2011. pp. 47-126. Haber R. The “spreader”: Technique and indications. In: Unger W, Shapiro R, Unger R, Unger M, editors. Hair Transplantation. 5th ed. London, United Kingdom: Informa Healthcare; 2011. pp. 279-81. Bernstein RM, Rassman WR, Rashid N. A new suture for hair transplantation: Poliglecaprone 25. Dermatol Surg 2001;27:5-11. 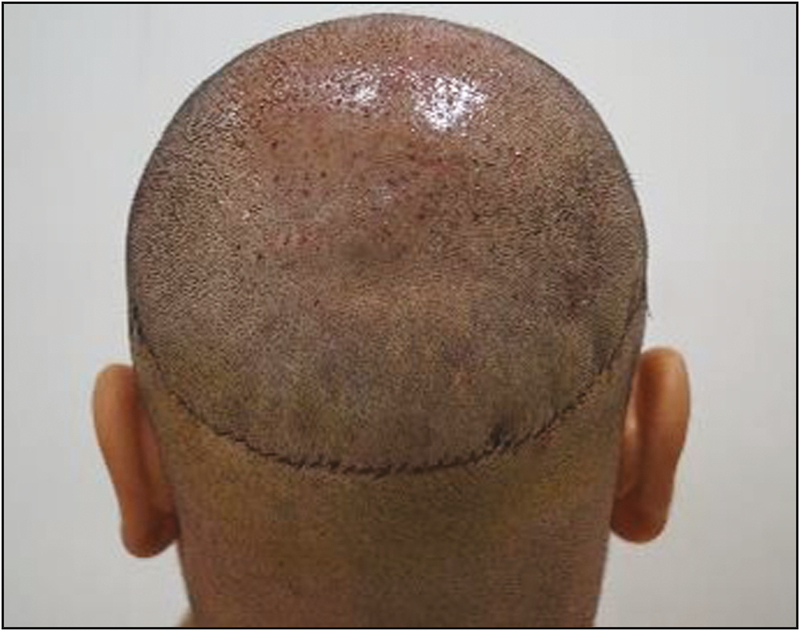 Mutuvel K, Laskhmikanthan S, Subburathinam D. Outcomes of staple closure of the donor area during hair transplant by follicular unit transfer. J Cutan Aesthet Surg 2014;7:103-6. Beehner M. 96-hour study of FU graft “out-of-body” survival comparing saline to hypothermosol/ATP solution. Hair Transplants Forum Int 2011;21:33-7. Knudsen R, Unger M. Donor area complications. In: Unger W, Shapiro R, Unger R, Unger M, editors. Hair Transplantation. 5th ed. London, United Kingdom: Informa Healthcare; 2011. pp. 419-22.